uniqueness, effectiveness and safety in everyday life use. * scratching and eye fatigue. United States Air Force, as well as the Boeing and Douglas aircraft manufacturers, and other airlines. Meeting those specifications and requirements means that it is approved for use by all departments and agencies of the Department of Defense. * 1-Douglas Aircraft CSD1-Aircraft Transparency, Sandwich, Corrosion, Paint Softening, Cadmium removal, Hydrogen Embrittlement and residue test. * 2-MIL-C-25769-H-Stress Crazing of Aircraft Transparencies. * 3-MIL-P-25690-Plastic, Sheets and Parts, Modified Acrylic Base, Monolithic, Crack Propagation Resistant, Stretched Modified Acrylic Sheet. * 4-MIL-P-83310-Plastic Sheet, Polycarbonate, Transparent. * 5-MIL-P-5425-Plastic, Sheet, Acrylic, Heat Resistant. Now, with a special arrangement SHIELD™ is manufactured exclusively for AIM International's consumer line. CRYSTAL CLEAR SHIELD™ is non-flammable, non-hazardous, has no adverse effect on health, 100% biodegradable, environmentally safe and ozone friendly and is absolutely 100% soluble in water when still wet. However, once it sets in and dries out it becomes a very strong water and oil repellent. It will not flash even after reaching the initial boiling point. CRYSTAL CLEAR SHIELD™ is so stable that neither would it exhibit any separation or layering of the compound even at a temperature as high as 62o C (143o F) or as low as - 23o C (-9o F), nor would it exhibit any precipitation or solidification of ingredients even after storage for a period of 24 months. WHY ARE CRYSTAL CLEAR SHIELD™ CHARACTERISTICS IMPORTANT? Static electricity is created by electrical charges at rest and is generally generated by friction as well as low humidity conditions. In such cases electrons are pulled from one object to the other. When electrostatic discharges are released, their shock can be felt by the human body, seen in static cling of clothes and fabrics or even heard as a flickering sound when combing hair, for example. When static electricity discharges itself due to friction for example, the potential difference causing the discharge can be very high--an extreme example is the lightening that can reach thousands of millions of volts. Static Electricity causes many electronic and mechanical problems. Electrostatic Discharges cause many operating malfunctions of high density, high power devices. This can actually result in data errors, altered memory as well as program loss and failure. Similarly, electrostatic discharge can be responsible for inaccurate readings on panel meters and oscilloscope faces. Static build up is so potent that it can actually damage computers. Furthermore, Electrostatic Charges are amongst the main reasons for the attraction of dust and other particles. These form and accumulate around sensitive data processing equipment--or any other surface for that matter. 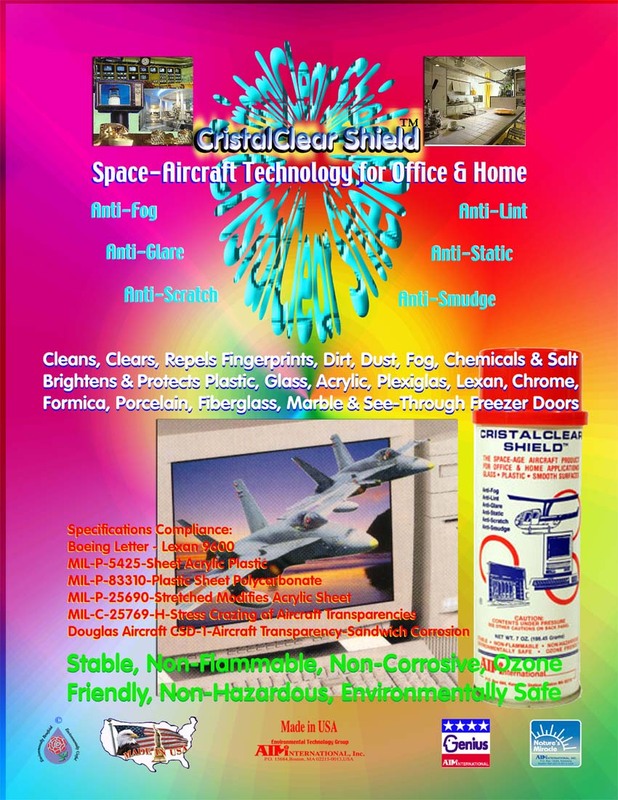 Regular use of CRYSTAL CLEAR SHIELD™ around office and home equipment, plastic and glass surfaces might help eliminate and prevent all of those problems. CRYSTAL CLEAR SHIELD™ leaves an anti-static charge that instantly neutralizes, dissipates and prevents electrostatic charges. These anti-static characteristics also repel and help eliminate dust and lint attraction, dirt build up and grime setting. Many glass and plastic surfaces and items are made with very special considerations in mind: Lightness in weight and low cost. Unfortunately, this makes most of such products vulnerable. The lightest rubbing or friction against such surfaces can cause scratching and dulling of surfaces. 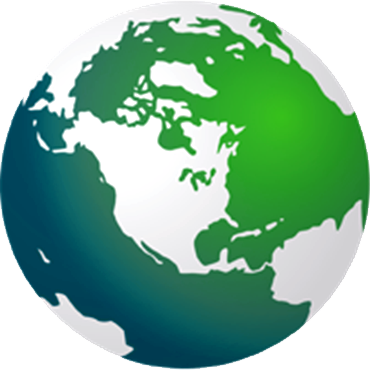 Similarly, exposure to the elements of the environment can cause embrittlement and cracking. CRYSTAL CLEAR SHIELD™ actually builds an effectively protective shield with a fine luster that fortifies surfaces and makes them more resistant to scratching and embrittlement. Also, the non-abrasive nature of CRYSTAL CLEAR SHIELD™ coupled with its mild ingredients that contain no waxes or acids leave no gummy residue, or film and is harmless to the surfaces and materials. Its foamy nature is very effective and safe in cleaning the exterior of all computers, electronic equipment, metals, plastic and painted surfaces. These fine qualities mean that there will be less need for repeated cleaning--which would require rubbing and friction applied to the surfaces--because CRISTAL CLEAR SHIELD™ makes treated surfaces easier to clean. Taking all those factors into consideration entails that CRISTAL CLEAR SHIELD™ reduces wear and scratching. Lint is usually caused by the fuzz of fine raveling and short fibers from wool, hair, yarn and fabric. Lint is not only a nuisance that accumulates as dirt on surfaces, but it is also a very dangerous element. Two of the serious characteristics of lint are: Its high affinity for attracting and retaining static electricity, and acting as host for the accumulation of dust as well as a favorable medium for the hateful allergy-causing "Dust Mites." Apart from blurring vision and making surfaces look dirty and ugly, lint compounds the problems of static electricity. It can accumulate inside equipment and cause them to malfunction. Yet, the most serious adverse effects that lint contributes to are the health risks of asthma attacks, wheezing and other severe allergic reactions. Many people complain from shortness of breath, fatigue or allergic symptoms that they experience when in office or at home, without realizing that lint is one of the major sources of their suffering. Generally, such people are allergic to "house-dust." Amongst the most important components of allergy-causing house-dust are the waste product particles of the microscopic insect-like creature known as "Dust-Mite." Daily, a mite produces 20 waste particles, which are very strong allergens that remain potently active for very long periods. Mites multiply at the rate of 25 to 50 every three weeks. Lint usually acts as a favorable medium for mites and their waste. Brushing against a linty glass door, plastic surface or sitting in front of a lint-filled keyboard or monitor might trigger off a strong allergic reaction for some people. As moisture, fog is water vapor diffused or condensed to fine particles in relatively small quantities. The impact of fog is usually compounded by the dust and smoke particles it contains. This adds fog density that reduces visibility or causes murky vision. Furthermore, water-fog causes oxidation and rusting of metallic surfaces, but it also leads to chemical corrosion due to the acid formation that results from the dissolution of smoke and smog in the water-vapor particles. When CRYSTAL CLEAR SHIELD™ is applied to screens, windows, inner sides of windshields, industrial masks and sports-goggles, it creates an invisible water-repellent shield that resists the formation of fog. CRYSTAL CLEAR SHIELD™ creates a water-resistant shield once it dries up. Repeated applications will ensure strong and better fog and water repelling effectiveness. This is an advantage that supermarkets find useful in treating see-through freezer doors. The added anti-salt characteristic of CRYSTAL CLEAR SHIELD™ makes it ideal for applications to harbor lights reflectors, lighting houses, as well as windshields and windows of airplanes, boats and ships. Fingerprints are caused by dirt combined with oily hand-excretion which are Lipid substances--a combination of fatty acids and glycerol. In addition to their hazing effect and ugly appearance on surfaces, fingerprints act as nuclei or accumulation points that attract dust and lint because of their oily nature. Because CRYSTAL CLEAR SHIELD™ creates an impenetrable shield that makes future cleaning easier and quicker, fingerprints can be buffed away easily. This is a characteristic that heavy-touch areas desperately need. Hotel lobbies and glass-doors, display windows and showcases in stores and Museums, as well as glass teller-windows in banks do need CRYSTAL CLEAR SHIELD™. Apart from the Lipid, there are two other types of oils: Mineral oils of petroleum origin; and essential oils extracted from plants' aromatic glands or fatty fruits. While people are usually aware of the effects of oil and grease from machines, equipment and automobiles, they scarcely notice that perfumes and food oils do have similar effects. Usually, the greasy nature of the two types of oil attracts lint and dust. However, in some instances they have lasting staining, dissolving and/or embittering effect, especially on plastic, Plexiglas, acrylic, Lexan, chrome, Formica, porcelain, fiberglass and marble. CRYSTAL CLEAR SHIELD™ breaks down oils and effectively remove them. Application of CRYSTAL CLEAR SHIELD™ on safety goggles, work and inspection shields, helmet visors, plastic masks, and helmets become as important for a welder and an oil-field worker, as it is for a pilot or a firefighter. Because of its anti-oil power, CRYSTAL CLEAR SHIELD™ can be used on anything that needs to be cleaned and protected from oily hands or splashing oil. Scope and dial surfaces, picture tubes, CRT and computer display terminals, radar, and Video game screens always suffer from major problems that make them difficult to look at for long periods. Dirt, lint, smudges and fingerprints interfere with clarity and cause parts of these surfaces to be more reflective than the others. Such uneven light reflection causes glare and makes characters and images difficult to see. The result is an eyestrain and sight-fatigue. To demonstrate the effectiveness of, or to make sure that, CRISTAL CLEAR SHIELD™ does what it claims to accomplish, use a dirty mirror and dry, clean, soft and lint-free cloth (we recommend the use of CRISTAL CLEAR SHIELD™ Lint-Free Wipes). The reason for using a mirror is that mirrors reflect their surfaces -- thus making it impossible not to see surface dirt. Shake the CRISTAL CLEAR SHIELD™ can well and hold it at about 8 inches away from the surface to be cleaned. Spray, sparingly, a thin mist-film. Very little amount of CRISTAL CLEAR SHIELD™ is enough to do the job. First, wipe to remove build-up dirt. Use a second clean cloth to dry and polish -- in a circular motion, moving up or down the surface, until the surface looks dry. If you detect any more dirt, repeat once more at the spot. Allow surface to dry for about 10-15 minutes before touching the surface. For excellent results, apply twice before testing the surface. To test the claims of CRISTAL CLEAR SHIELD™, get a polyester or woolen cloth. Rub one end against the other. Run either part against the cleaned surface. No static electricity's flickering sound will occur and the cleaned surface will not attract the cloth or any lint. To make sure, rub the cloth again and run it under a table or in a room corner. You will hear the flickering sound of the static electricity and the cloth will pick up dust and lint. Try to run the cloth as it is against the CRISTAL CLEAR SHIELD™ treated surface. No static charges will be released and negligible or no dust or lint will be deposited on the surface. Touch the surface with your bare hands or finger-tips. If any smudges appear, just wipe them off with a dry clean cloth. You will see how easily they will disappear. Check the surface after few days. If any deposited dirt or lint occurs, just blow off. Try to do that with an untreated surface. You will see the difference.